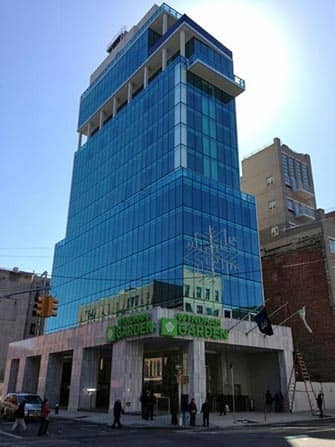 The Wyndham Garden Chinatown in New York is a luxury hotel with a great location. 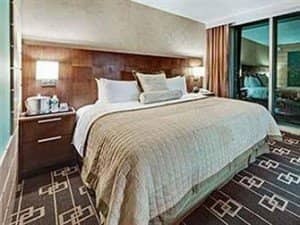 If you want to relax in New York in style then you should pick this hotel. The rooms are good but you can also enjoy a drink at the lobby bar, catch up on the news with a free newspaper or go for some exercise in the gym. In short, the hotel is well worth the price. The Wyndham Garden Chinatown is a modern hotel and its rooms are nicely decorated. What’s more is that the rooms are pretty sound-proof; you hardly hear the traffic noise. The beds are extremely comfortable and the rooms boast ergonomic chairs, coffee/tea makers as well as an MP3 alarm clocks. 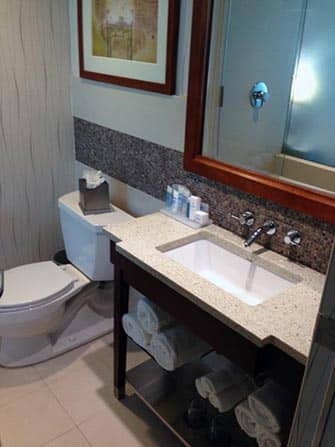 The bathrooms are nicely designed and stocked with great toiletries. The staff are very friendly and helpful and are happy to answer any questions you might have. You can make use of the free Wi-Fi connection, which makes the hotel perfect for business guests. The hotel offers continental breakfast which consists of porridge, toast and jam, coffee, juice and fruit. But you shouldn’t pick the hotel based on its breakfast options! You should pick the hotel for its location: Chinatown. Experience the hustle and bustle of the Chinatown neighbourhood and while you’re at it explore SoHo and Little Italy, all within walking distance! While walking around you’ll understand why they call New York the melting pot. The hotel is located at 93 Bowery between Grand St. and Canal St. subway stations. Here you can take the lines B/D and be in Midtown in less than 10 minutes. You could even head down to Brooklyn and Coney Island with the same subway lines. Note: You will receive a coupon for breakfast that can be redeemed in the dining area downstairs. These coupons cannot be used for room service. Though the breakfast is included in the price of the hotel, you are expected to pay a tip. You can leave around $2 a day for tip. You are also expected to tip if you store your luggage, around $1 per bag is sufficient. Eric’s Tip: Ask for a room with a view of Manhattan! You’ll not only be able to experience the luxury of the hotel but also enjoy a wonderful view of the city.